Nope, I have the x-controller plugged in separately. The only thing plugged into the IoT is the spindle. Do you have any further info on how to do this? 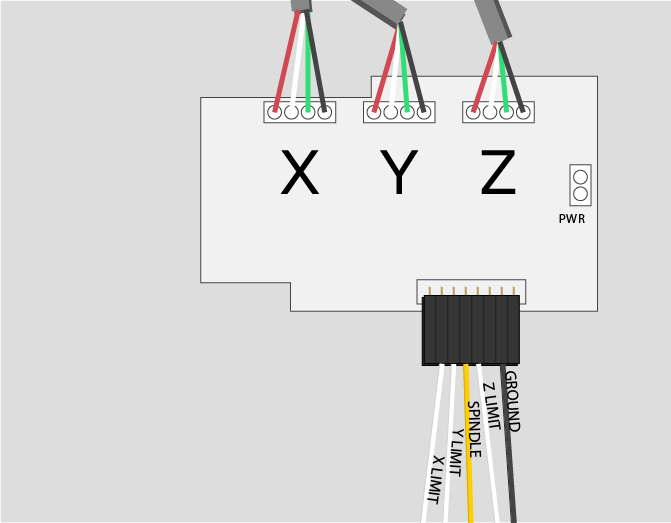 Am I understand correctly, than if I would like to use X_Carve controller to control the spindle on/off,it couldn't be done just with X-Carve controller - I should use some "outer" relay? Is there any manual about connectors I should use for that, and about voltage on them? Do you have xcontroller? if you do its trivial, just connect Spindle ON and GND to the pins you see there on the right. 110 VAC Mains to IoT Relay power input. 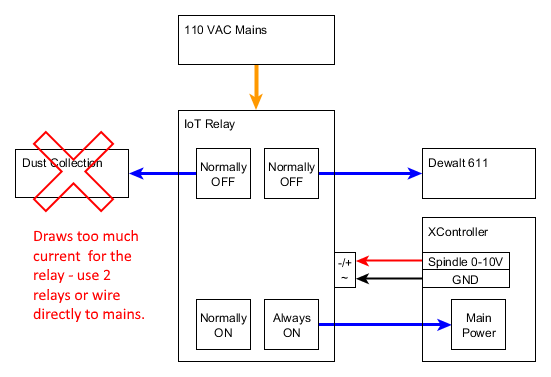 XController Spindle 0-10V output to IoT Relay control input, along with the matching GND wire. Thanks @PhilJohnson, that’s a good reminder. My “dust collection” system is really just a small shop vac. The Dewalt 611 is spec’d at 7A, and my shop vac at 8.5A (3.5 max HP), which combined at max draw is 15.5A which is over the 12A limit. Then there is the enclosed power supply in the X-controller which is capable of drawing 5.6A (but will likely draw less in most situations as all motors are not on full tilt all the time). But, it looks like if I want to do this safely, I will need to toss another relay in there. In the mean time, I will update that drawing to remove the dust collection (done) so that other people aren’t inspired by a picture only… and I will pull the vacuum off the relay as well. My oh my… times seemed to have changed, and quickly. I picked up mine for $29.95 on Prime at the end of November - cheaper than the Adafruit option when shipping was factored in. But now, the Adafruit option is certainly cheaper. I’ve read (and IMHO) don’t use relays in parallel. If one fails to switch full load is carried by remaining. Just not a great idea. Search for a 2hp relay. can you post the schematic/diagram/photos after you’re done?? I just measured the Dewalt running current with a Kill-A-Watt meter and it only draws less than 2 amps across its speed range. Free running or under load? I bought 2 of those on eBay for $4.95 each. Yep. It’ll work. I just got the exact same thing hooked up on my XC last week. Make sure to go thru the Easel config after you get this manually working and set the spindle for ‘automatic’ when you are done. You’ll also need maybe change your PP if you use Vcarve to have the commands sent out to turn on/off the spindle. Exactly like @PhilJohnson said - the DC trigger would be split, that’s all. ok. I can’t see anywhere here, if I just hook up the relay, as per diagram, do i need to change anything in GRBL?. My spindle won’t turn on. It’s plugged into the normally off. the iot relay is wired correctly. I don’t have anything else plugged into it, and yes my dewalt is set to on. I have the iot relay off amazon. when i select test spindle on, nothing happens. Is there coding i need to do? as of now, i’ve just wired it in. I also did the machine machine inspector. M3 S12000, Nothing happened. Yes. The normally on works, in that it has power. I did check to see if it turns off. Is there a setting that you change, so that is switches on, and off? Or should it be doing it right from the start? Pretty sure he was just giving a scenario to help you understand. Don’t worry. We won’t make the mistake of trying to help you understand again. Have a wonderful day. What? I said have a nice day. You may want to re-read the thread. It’s not that you can’t plug a vac in. You can’t plug a vac AND a Dewalt in. The combined current when running both is too much. I run my vac off of 1 IOT relay and my Dewalt off another. Doubt if you could run one shop vac and the x-controller let alone two. It’s not running two in his scenario. It’s running one at a time, which is perfectly within the current capacity of the relay. In a Normally On (Closed) and Normally Off (Open) scenario, there’s no way in a non-fault state that they are on at the same time. Especially on a mechanical relay that is physically breaking a connection and making a new one. As for the Xcontroller, it’s current draw at A/C is max like 4A. 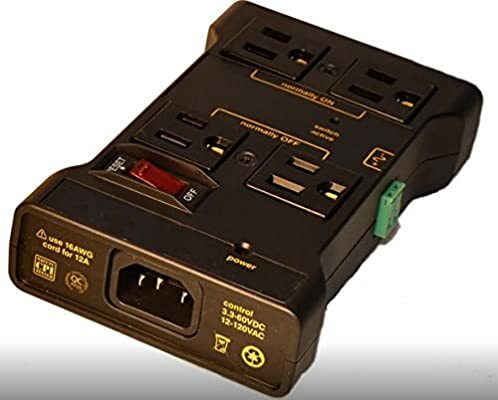 So you could run an Xcontroller and a vac/Dewalt on a single IOT relay (the new version with an idiot proof “Always On” outlet) with no issues. Other than the fact his statement was offensive. That’s not offensive. He didn’t personally attack you or anything. He just said that you had people try to help and YOU laughed at them. That’s what offensive. Literally the first thing in your reply to Angus was “lol”.